Maintaining a home while living a busy life is never easy. Nature’s elements take their toll; technology for the home constantly charges forward; and shifts in interior design trends all affect the value of your most prized investment and prompt a desire to take on renovations, improvements or remodel projects. 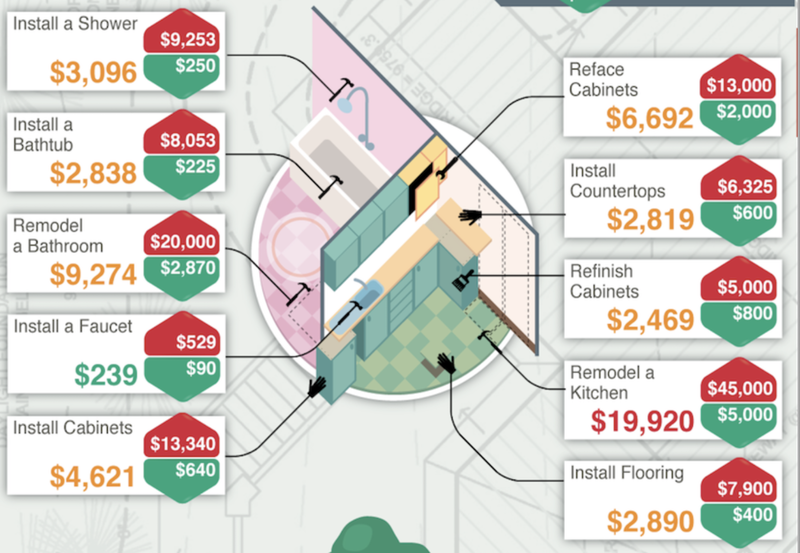 As you can imagine, some renovations a yield positive return on investment while others fall into the money pit category. Let’s take a deep dive into how home repairs, improvements and renovations affect the value of a home, specifically with respect to preparing for sale, refinancing or just making your investment grow. It is pretty obvious that an overgrown landscape and decrepit playsets hide and distract the consumer from the beneficial features of a home. Cluttered interiors go beyond what hides in the closets to include an overabundance or artwork or oversized furnishings. Properly staged homes have been cleaned and decluttered inside and out for a reason; it increases perceived value. Fixing a leaking roof, finicky plumbing or dead light fixtures all fall into the repair category; and all unaddressed repairs will hinder value (not to mention the quality of home life). In a sales transaction, needed repairs surface early in the escrow process after the potential buyer pays for a professional inspection. The needed repairs discovered are requested to be corrected by the seller or credited in a dollar value. Refusing repairs could kill a deal. Because clutter and overdue repairs will almost always hurt the value of a home, we will focus on renovations as investments like a bathroom remodel, or adding solar to a home, and how these improvements equate to a positive increase in home value. This topic of return on investment in regard to real estate renovations is widely speculative. There are material choices that sway costs, size and scope of a job, regional variables to how tradespeople are compensated and of course, opinions. Luckily there is ample data on costs and values of many common renovations. Let’s review some renovation examples for a common home. Repairs aside, the exterior of the home is the area of most importance in the process of estimating value in the eye of the consumer. With home shopping starting online, it is the one single exterior image that will get a buyer to click or not click to learn more about a property. When buyers pull up to a home, it is this first impression that establishes value and if it is a seller who cares about their property. Landscaping Upgrade: Flagstone path, stone planters, five flowering shrubs, one deciduous 15-foot tree and landscaping bark. Exterior Home Paint: Full color change on a house that does not need painting. Note: as mentioned before, if a home has aged, cracked and peeling paint, you should paint. The low cost or new paint will return in value over damaged paint. Replace Wood Windows: Windows are a tough renovation in landmark districts like Bungalow Heaven. Replacing them is near impossible to get permitted while restoring historic windows can be more expensive than new ones. This will come down to what you can get approved and your specific costs. While the exterior gets the buyer wanting more, the interior is what a resident interacts with the most. I always encourage my buyer clients to imagine themselves sitting in the living room and ask how that makes them feel. Naturally, you want a positive response. Neutral, un-scuffed interior paint is a given, but what about other upgrades? Refinish Hardwoods: Removing carpet and refinishing hardwoods are very common moves to modernize and restore a property. The heart of the home is the most expensive area of renovation, but it also creates the most impact. While DIY Network and HGTV have done an amazing job of making everyone think they can do what Chip and Joanna Gaines can, there are limits to what the average buyer will tackle. Minor Kitchen Remodel: New cabinet fronts and hardware, new appliances, new counter top and sink, new flooring. Major Kitchen Remodel: Semi-custom cabinets and 3 x 5 foot island, new countertops, stainless sink, new energy efficient appliances, range hood, laminate flooring and custom lighting. The second most expensive area and the more challenging due to the constant battle with water, the bathroom has a major impact on how a buyer perceives value. Bathroom Remodel: An existing 5 x 7 foot bathroom gets all new fixtures, porcelain on steel tub, ceramic tile surround, new toilet, vanity sink, ceramic tile floor and medicine cabinet. These seven examples are just part of what I was able to track cost and ROI data on, there are hundreds of other examples in the report stack that I compiled. To download the reports with over 65 pages of costs and returns, just fill out the form at the right hand part of the top of this page and it will automatically open the PDF. Example page from the stack of reports. While many of the improvements or renovations depicted in the reports cited do not show a positive return on investment, it does not mean that there isn’t value to be had. The rabid flippers in Southern California are proof that there are profits in renovation. The three most impactful ways to cut costs are: 1) Doing as much labor on your own; 2) researching and shopping materials yourself; and most importantly 3) shopping your contractors. Contractor pricing varies. One roofer may quote $21,000 while another quotes $9,000 for the same house proving materials and quality of work will vary wildly. Your best bet is to start making a list of contractors and get four to five quotes. In addition to the quotes, ask for references from each contractor and contact those references. You will be glad you did. You can then use the data from these reports to set your budgets to ensure that you can create ROI from the upgrades to your home. Marble tile for a renovation will cover a floor just like ceramic tile will but at triple the cost. With ROI in mind for a single family two- to three-bedroom Bungalow Heaven Pasadena home, choosing marble, or anything on the high end of the material spectrum will generally not yield a positive return on investment. Going to the low end of the spectrum, like a mass-produced ceramic tile should also be avoided, the average selling price of the neighborhood is not going to draw the budget buyer. The key is to find the mid-range in materials like a porcelain, slate or granite tile. Staying period-correct with linoleum could also be an interesting solution for areas like the kitchen and mudrooms. Using the mid-range methodology for all materials, fixtures, appliances will give you better chances of seeing a positive return. When pricing a home to go to the open market, a realtor will pull comparable sales in the neighborhood. Comparing a 1,300 –square foot, 3 bedroom/2 bath home that has a remodeled kitchen to one in the same neighborhood that has a 1970’s kitchen will undoubtedly show a value difference. But it is nearly impossible to find comparables that have only one improvement difference, especially in Bungalow Heaven where every home is unique in its own right. There is a however a general sense of Price per Square Foot (or PPSF), in particular when compared to houses of similar specs (square footage, bed/bath count, lot size). For example, you may see differences from $500 PPSF to $550 PPSF, with the difference being the renovations and details of the home. While this seems like a nominal difference it equates to a $75,000 price increase on a 1,500-square foot home. Appraisers generally default to PPSF of sold comparables to determine a home’s value, then they will adjust for specific features included or not included. Renovations will undoubtedly increase the appraised price. While solar can seem a very expensive option for improvement, there are some nuances that may make it a viable improvement with a positive return. Tesla Energy (formerly Solar City) has a staff of full time roofing contractors. If your home is in need of a roof for repair, their cost of doing the repair is generally 50% of what a standard roofing contractor would charge. Naturally, you have to buy a solar system from them, but the monthly payment for the system and the roof repair is generally at or just under what your normally pay for electrical utility. A solar equipped home will have a higher PPSF. If you are considering solar and need a new roof, I recommend you investigate with Tesla Energy directly. You will be surprised at the potential savings and benefits from their program. I am taking a closer look at solar through my contacts at Tesla Energy so stay tuned to my blog and social media channels for the full story. As a realtor, I can generate a custom comparative market analysis for your property. Together we look at all the sold comps in the neighborhood and add or subtract for renovations to come up with your homes current or even projected value. It is a handy tool and easy to produce. Just contact me and we can begin as soon as you are ready. 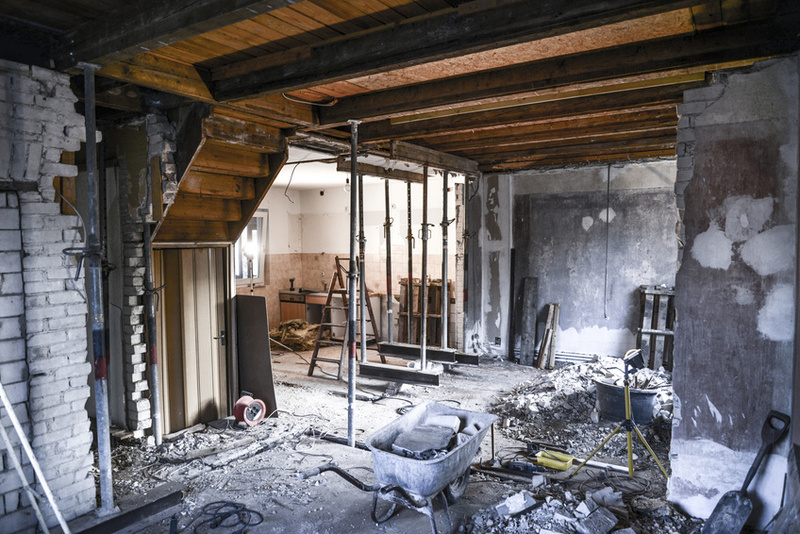 Home renovations can be very challenging but armed with the data, you can make it profitable for when it comes time to sell.